The big breakthrough in touchscreen text entry was, without a doubt, swipe-style input. Being able to slide your finger on the screen and have words materialize feels almost magical at first. But the market seems to be cornered by Swype, SwiftKey, and whatever keyboard came with your phone (more often than not, a variant of Swype itself, because the company works with phone makers). Back in January, I wrote up an extensive test to determine which is best: Swype, SwiftKey, or SlideIT (A third, less known contender). Had I written that post today, I would have included TouchPal X, a capable and very customizable sliding keyboard that brings its own Blackberry-like twist to the text prediction game. Before we can decide if an app delivers, we need to see what it promises. 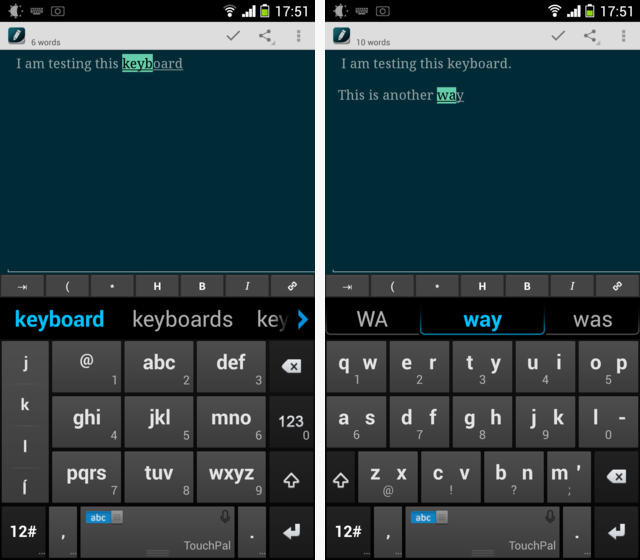 The banner feature is word prediction where “words emerge out of the keys”. If that sounds familiar, that’s because it’s exactly how the Blackberry Z10’s keyboard works. I, for one, was quite happy to see this feature come to Android, and it’s not the only trick TouchPal X has up its sleeve. You get not one, but two modes of T9. The one shown on the right is not exactly T9 but the principle is just the same: Big, roomy keys to tap on, and a text prediction algorithm. And just like on your old Nokia, you can’t slide between keys. There is much to be said for T9 as robust single-hand text entry system – we’ve even shown you a launcher based on T9 just recently. Nice to see a keyboard maker who still takes it seriously. I’m typing this into Draft, one of my favorite Markdown editors for Android, and the top toolbar (with the parenthesis, asterisk and so on) belongs to Draft. To the left, you can see some text entry action: As promised, words “emerge” out of the keys. Just like on a BlackBerry, the predicted word is placed according to its initial letter (so “day” comes under the D key). I’m not sure how often I would really use this feature, but having the predictions pop up on the actual keyboard makes them more visible (you do get predictions in the top bar, too). To the right, you can see a mode dedicated to solving one of the more annoying aspects of text entry on Android: Moving around. Yes, you can tap the screen and drag, but it’s a fairly terrible user experience. 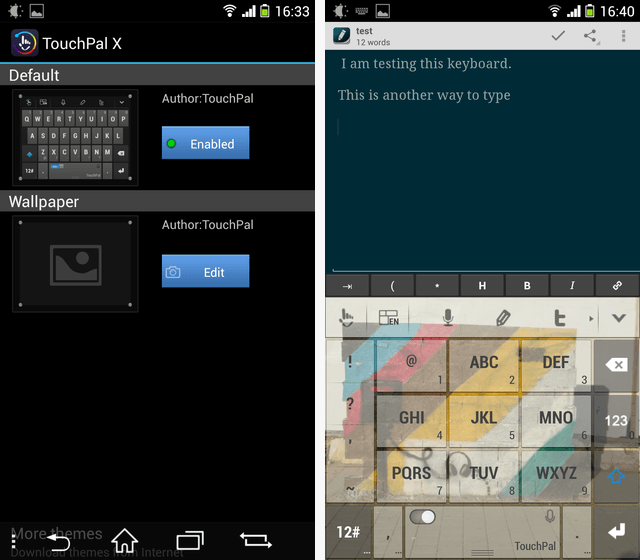 TouchPal X offers a roomy edit pad that even the fattest of thumbs would feel comfortable on. You can move the cursor around, trigger text selection, and perform common editing operations (even enter a space if you have two words fused together). 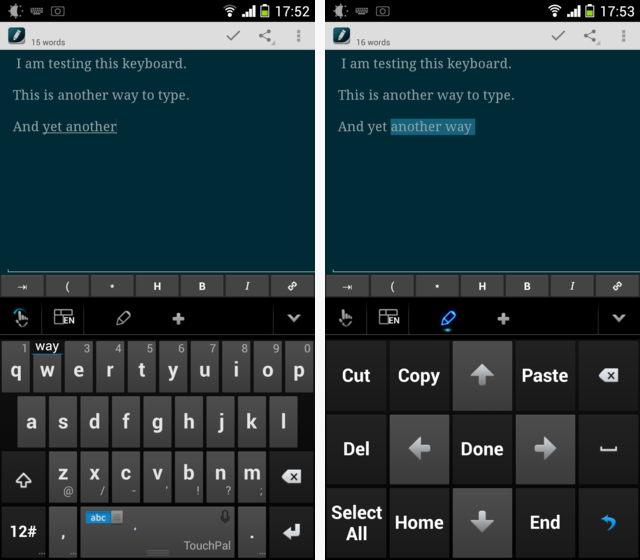 Throughout my testing, TouchPal X felt swift and responsive. Then again, I was using the Sony Xperia Z1, so just about any app feels responsive. You can customize anything from keypress sounds to whether or not predictions should be animated. TouchPal X comes with a built-in store much like the one used in Go Launcher, which we reviewed back in 2011. The store features many themes, as well as languages. To the right you can see some languages have the “Wave” feature – the official name for “words appearing on keys”. Languages with no Wave support still have swiping, which is the important bit, really. It’s a great way to make your keyboard look terrible. 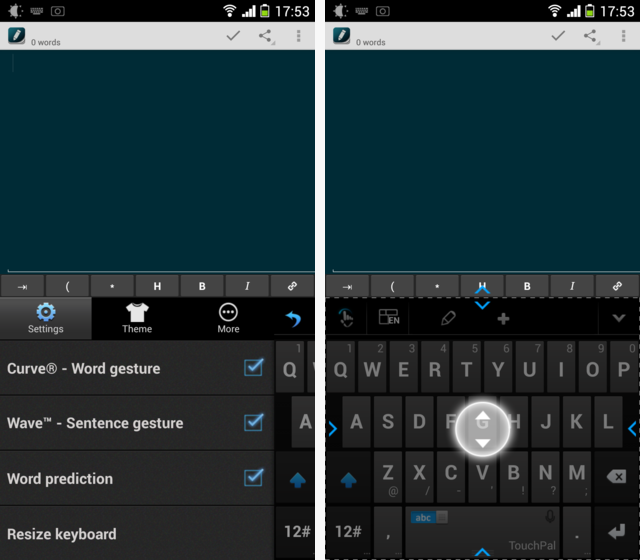 TouchPal X is free, powerful, versatile, and mature. I can’t promise you it will win you over, especially not given the two other fantastic options which are out there, but it’s definitely worth a try. Keyboards win or lose based on everyday reliability and accuracy, not fancy features. To see if this is the keyboard for you, you’ll just have to try it out. Let me know how it works out in the comments – bonus points if you type the comment using TouchPal X, without correcting any of the typos.